The seller of today’s Nice Price or Crack Pipe Smart says it’s for off-road use only, but that he really doesn’t care what you do as long as he gets his asking. Let’s see if he’s asking too much to look the other way. Few of you were willing to Putin the $9,999 required for yesterday’s 1986 Lada 1200S. Fully 79-percent of you checked the Crack Pipe box for the white Russian, and that meant it ended up with a substantial loss. I’m still checking to see how many of those votes were by bots, however. Would you like to drive a fun car? How about the Fun Car of the Year (FCoY)? That honor was bestowed by Top Gear in 2005 to the Smart Roadster and it’s incongruously named sibling, the Roadster Coupé. Never heard of either this Smart car nor the Top Gear award? Don’t worry, I got you, Fam. Smart GmbH is a division of Daimler AG, and since 1998 has been producing tiny two-seat ‘city cars’ that harken back to the glory days of the cheap seats bubble cars of the immediate post-war era. So small they can be parked three abreast in a traditional single parking space or be stolen by a quartet of fairly stout hooligans, the Smart ForTwo has proven to be remarkably successful. Surprisingly, its bigger companions have not. A more traditionally sized FWD four door, appropriately named the ForFour and developed in conjunction with Mitsubishi, failed to light up the sales charts. 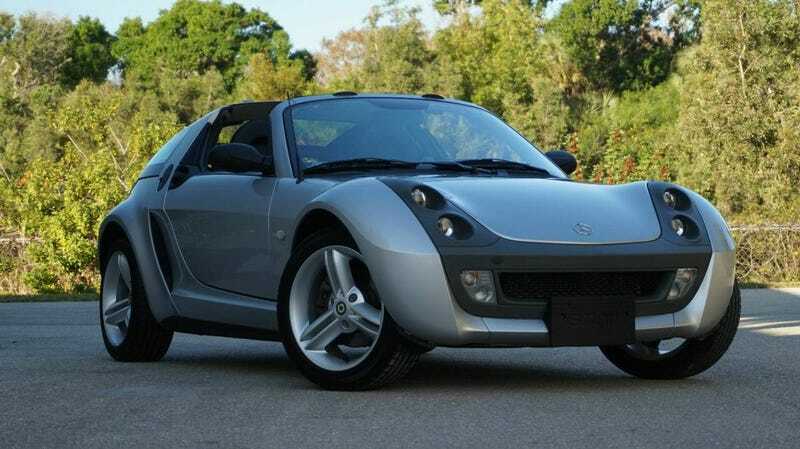 The company’s small sports car, the rear-engine Smart Roadster/Coupé, sold okay but was pulled from the market due to high warranty repair costs stemming from inherent design flaws. Neither the ForFour nor the Roadster ever officially made it to America. I like his give me my money and then get the eff out attitude. It’s refreshing. The car is equally novel, and as an owner of a side-curtain Sprite, I can see parallels in intent with this small sports car. First off however, that dumb name. Smart built two versions of this car, the Roadster which had a flat decklid in back, and the Roadster Coupé that substituted for that a glass bubble back. That created a load space over the engine compartment, making the car practical even if its name was less so. Both cars shared body panels forward of the B pillar, including a targa roof and cheeky pond frog front styling. This one, in silver over two-tone grey and black leather, comes with just 8,100 kilometers showing on the clock. At least that’s what the seller claims the mileage to be. It could be the trip odo for all I know. Over all it’s in decent looking shape both inside and out, and features a center-mounted ignition like it thinks it’s a Saab. Mercedes badges have been added to the car too, just adding to its identity crisis. Power here is applied by a turbocharge 698-cc Suprex triple, and that’s fed through a six-speed automanual gearbox with flappy paddle shifters. The ad claims the addition of a performance chip in the ECU and that is supposed to bump up the ponies from the factory 80 to over 100. That should make the Smart take off smartly, but this is still not going to be the car in which to go trolling Mustangs, Camaros (Camari?) and Hellcats. The seller says the car is rare in the U.S. and he’s right. Smart built over 40,000 of these cars but they never bothered to have them Federalized so even though you could easily bring this car into emissions compliance by swapping out the engine with once from a U.S. market ForTwo, it’s still not going to meet all the other requirements for road use here. It won’t get a pass on any of that until 2029 and we’ll all be dead or fighting Mad Max for the last can of cat food by then. Despite the New York Craigslist ad, the car is claimed to come with a clear Florida title. That of course is about as reassuring as getting clean bill of health from Trump’s doctor. That ad claims that the car previously lived in California which led me to see if it was the one I saw on a New Years Day road rally about 10 years ago. As you can see from the pic below, it is not. Okay, that means there are at least two Smart Roadsters here in the U.S. and while that suggests the model’s not as unique and special as you are, it’s still pretty damn rare. I’d also say it’s equally interesting and desirable. The question is: could it be $26,900 interesting and desirable? That’s the price, and it’s now your job to say whether or not that’s a deal. What do you think—in spite of the daunting prospect of either keeping it as is and potentially getting one-day special use passes for road adventures, or trying to get it Federalized—could this Roadster even be worth that kind of scratch? Or, at that kind of price, would you simply wait until ’29 to get Smart? H/T to Tony Margulis for the hookup! At $9,999, Could You Find A Lada Love For This 1986 VAZ 2101? 1958 BMW Isetta Convertible for an Eggcellent $39,650!